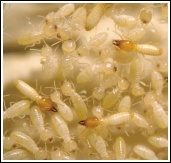 Traditionally, termite pesticides have been some of the most toxic that exist. One widely used product was taken off the market due to the numerous adverse human health effects. Termite pesticides are made to last for the life of the wood. Do you really want to risk it with toxic products? Buy this SaferBuilding™ How-To Sheet to learn alternatives to controlling termites, understand the safety issues involved, and how to talk to your suppliers about them.